The cirrocumulus lenticularis got its name from its lentil shape. The word lenticularis is a Latin word meaning something that looks like a lentil, lens or an almond. What are cirrocumulus lenticularis clouds? These clouds typically have the appearance of crests. They are made up of atmospheric waves, which, otherwise, would not be visible. They are elongated in shape many a times and can be distinguished by the boundaries that they also have. Unlike other cirrocumulus subtypes of clouds, these clouds form when the stable air is being pushed upwards. The clouds form due to the orographic features of the land, such as the mountains. Another thing that occurs with these clouds is irisation. Irisation, in meteorology, is a specific type of photometeor. This is an effect caused by sunlight that is diffracted by the clouds. This phenomenon causes multiple iridescent mixed colors to be visible from the ground. The brilliant colors that are produced in this occurrence often give the clouds an appealing effect. The colors that are produced are also very similar to mother-of-pearl. The irisated colors oftentimes appear like bands of parallel colors at the edges of clouds. 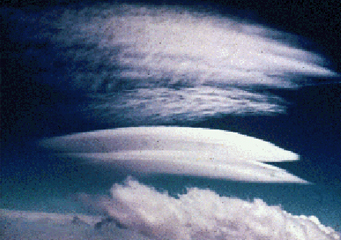 These are also the ones that create the boundary effect in the cirrocumulus lenticularis. There are many types of clouds in the cirrocumulus classification. The cirrocumulus, being one of the three major classifications of the clouds also has many subspecies, called the cloudlets. These subspecies are very similar to each other in appearances, and only differ in terms of one small aspect or the other. The droplets fall down in the form of a virga, which is a type of precipitation that includes droplets of ice and snowflakes. It doesn't mean that all cirrocumulus clouds are snow clouds, though. Even if they are very cold clouds, and even when they can create snow, their occurrence doesn't always mean imminent snow. Snow is an altogether different phenomenon that forms in very cold places during the winter season. In most cases, the presence of the cirrocumulus clouds only means that the water in the atmosphere has condensed as high as the altitude of cirrus clouds. What height are cirrocumulus lenticularis clouds found? They are all very cold clouds, as they form in altitudes between 16,000 feet and 39,000 feet. At an altitude that high, the clouds are bound to form ice crystals inside them. What do cirrocumulus lenticularis clouds look like? The cirrocumulus lenticularis clouds resemble the look of tuft cotton, which is the same for all other cumulus clouds. The cirrus prefix in this name means that the cloud is of the cirrus type of clouds, which are clouds at relatively high altitude. These clouds are translucent when viewed in a near location. However, as that is often not possible unless you are viewing from a plane or from a really high mountain or tower, the cirrocumulus cloud will be very visible to you. The color is mainly white, and the clouds look like patches in the sky. In times, however, the clouds will turn grayish in color, too. This is due to the continuous evaporation and condensation of the water in the clouds.